Apparently, I've Been Domesticated: Microwave on Counter or in a Cabinet? I was initially planning on using the wall cabinet for the microwave, as seen below. Then I thought about putting the microwave under the counter like I saw on Ikeafan knutter's gallery. But the more I thought about bending down to reach under the counter to use it, the more I thought I probably wouldn't like it. Then I thought it would be better to use a regular 24"W wall cabinet and put the microwave on the counter below it. At 5' 3" I thought the height would be good for me, plus my daughter would have easier access to it. 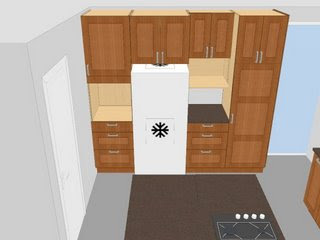 The only thing I'm unsure of is that there are no 24"D cabinets...like the above the fridge ones. I'm wondering if I should use the frame of a 24"W x 12"D wall cabinet and attach a second one in front with the doors. This way it'll be the same depth as the other three cabinets at its level. The question is, would that even work? Is it worth doing?...will those 12"D doors open without a problem sandwiched in between cabinets twice as deep? OR should I use a 12"D cabinet above the fridge too?